Unlike a cold ocean swim, the warm waters of the spa provides a soothing, controlled environment for uniform exercise of the dog’s muscular and skeletal structure. Canine behaviorist have found therapeutic benefits in shaping behavior to assist in reducing aggression and behavior modification for dogs. The Total Dog is a swim and gym for dogs. They offer 2 indoor spas, tread mill, weight scale, friendly knowledgeable swim staff, Natalie Lindberg, RVT and Carol Williams, RVT, and a dog grooming area for drying your dog. Even towels are provided for you and your dog when you workout. Clients can swim with their dog in the spa for self swim workout or have a private workout with a swim instructor to swim your dog. 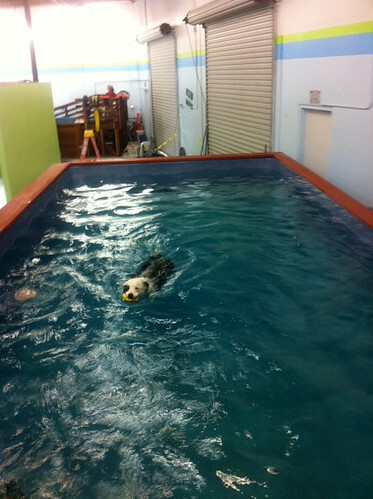 It’s a fun gym for you and your dog to keep fit by swimming together. Here is a news clip from the Channel 8 news interview at The Total Dog. 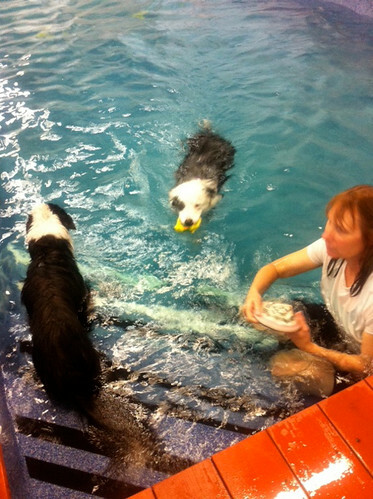 Zippy is the happy blue merle border collie swimming in this new report.